Time for a Tea Party. 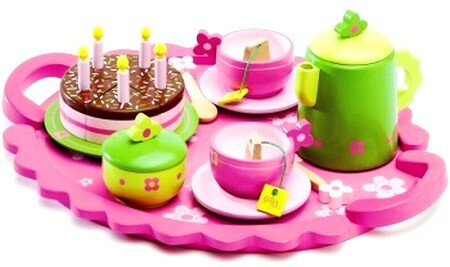 A little girls pink dream this whole tea set is made of high quality wood, including wooden tea bags (so cute) and a cake with removable candles. A really special toy that is made to last for the next generation. One of the most beautiful wooden toys I have ever seen. It excels in every sense, design, idea, finishing and usability. If only every toy could be this perfect! Size: The tray is 30cm by 22cm. The tea pot 9cm high by 6cm wide. We like this because: "We gave this to our daughter for Christmas when she was 3. She is now 5 and still plays with it all the time. A beautiful toy, beautifully made. A tea party with food yum!"